Edit: Google just told me, that a “Big Pack” should be 6.6 x 8.6 x 2.4 centimeters. That’s a real challenge for a QRP transceiver inside. Hi Peter, Well done, you even have enough room for a couple of tactile switches hi. Have been giving it a lot of thought myself and looking at the sandwich approch (RX top, TX bottom) which will double the space provided I use very low profile components. Please keep me updated I am really looking forward to see what you come up with. I think i fell inlove in shirt pocket and i think i would try to do this. That rig would make a fabulous kit! Right now, I’m recalling a tech guy at the now-defunct Maryland Radio Center in Laurel who built a double-sideband rig for 80 meters into a small box about the size of a cigarette pack back in the late-80’s or early 90’s. I can’t remember his callsign, but his work was mentioned in the QRP Quarterly, as well as elsewhere. There were no surface-mount components in his rig, as I recall, which would make such a rig doable with miniature components like the miniature crystals and other SMD’s.. Congratulations on a fine rig! For a 12 volt supply at 5 watts out that would be about 15 ohms, not 50. At 1.5 watts out the match would be close to 50 ohms. So missed taking the degree of efficiency (abt. 50% in class AB) into account. Fantastic work Peter, I’m so impressed. Your design choices and techniques are similar to some of my projects, although you far exceed the density I have managed to achieve! I attempted a compact ‘walkie talkie’ transceiver for 40 and 20m SSB and CW, over the VK winter. I wanted it for SOTA work. I based it on the G6LBQ circuit, with mods. Click thru to my site, you’ll see the post and video there. I would be delighted if you posted a comment there. I have subscribed to your channel and blog and will continue my catch-up reading. Keep melting solder. 73 VK3HN. BTW: Actually I didn’t know that you have snow Down Under. Looks a little bit like the situation in Black Forest here close to my front door in winter. Love those mountain and outdoor activities, too! Thanks for the nice video about Fedration Range peak! Hi Peter, thanks for the quick response. I am very much still learning how to make short, engaging videos, I take about ten times more video than ever makes it to Youtube, altho I am pretty sure that is true for most people. Your tiny rigs might inspire me to keep working compact! I haven’t yet built a SA621 bilateral design, would like to try that one day. What I like about small rigs is how you need to design both the physical and electronic aspects of the radio together. It’s a true craft. Federation Range is only 1300m above sea level but is covered with up to a meter of snow at times during winter. The Great Dividing Range stretches from just north-east of Melbourne to Canberra, the summits, 1300 to 2200m, are mostly snow covered from June to September. It makes a nice escape from city life and a great location for SOTA and portable operating, We are lucky in VK3, we have snow till September, then heatwaves by December. 73 VK3HN. Another question Peter. To test the relays for stray capacitance, did you simply put a digital LC meter cross the open pins? What stray capacitance (pF) would you consider unacceptable? Hi Peter, I am part way through building your design also, although nowhere near as small. I have the Rx going and its’ not very sensitive although not debugged at present. I was wondering what sort of sensitivity to expect in terms of dBm or uV? Hello Glenn, I don’t have any suitable equipment here to measure rx sensitivity exactly. A simple way to estimate the proper function of the recevier I always go is to connect a short peace of wire (abt. 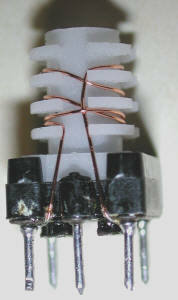 1m length) to the input of the receiver. Then band noise must signifiantly increase and stations must be audible in the speaker with e reasonable S/N-ratio. From other NE602 designs I know that receiver sensitivity is around 1uV or better. Edit: Another test I frequently do is to use an old KYORITSU dip meter. The receiver must be able to detect the signal from a distance of about 10 to 20 meters with the rx connected to my antenna (delta loop). The dip meter only has a coil but no antenna and oscillator output is very low. OK, Thanks Peter. Currently I am getting about -70dBm but its early days really. I only just tried it yesterday and no time to debug. I’m thinking my injection levels from Si5351 maybe a bit low as i have attenuators in line with them. One thing though was to alter the low Z winding on the BPF from your 9 to 4 turns. I am using TOKO formers with 31T as the ~15uH to resonate with the 33pF caps. When i tried sweeping the BPF with the 9t, i had an extremely wide response. it covered 40 to 20M bands! Have you altered this in any way. With the 4T i got a nice 40M bp response. concerning injection levels: I don’t think that is severe. NE602 requires some 100mV pp here so I always found out that signal level tends to be lower than higher because of the need to avoid excessive drive of the LO input of the mixer. 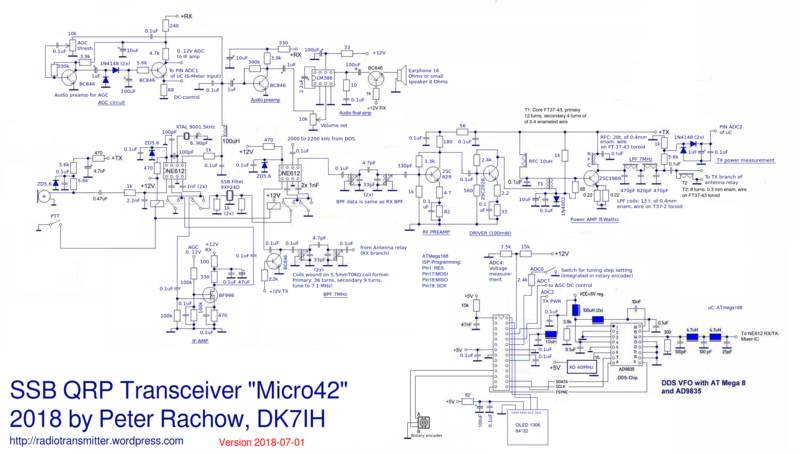 Band pass filter: Maybe when I find time this weekend I will connect a respective bpf to the spectrum analyzer and trace it. Without precise data I only can say that I always had a very sharp peak when tuning it to maximum pass through of desired frequency. But I will try to get exact measurement this weekend then I can say more. Peter, I found the problem…. The BC846 AF pre-amp was saturated. ie collector at near 0V. Reason was that I had the 1uF Tant coupling cap into the base, reversed. Leakage turned the BC846 fully on. Sensitivity now is around or better than -100dBm (3uV) from HP8640B sig gen. -110dBm is audible. I still have the BPF windings as detailed in previous post. In my version of your project, I have two PCB’s about 100x70mm stacked one over the other. One contains all the RF parts, the other the AGC/AF amp and Tx PA stages. A separate pcb houses the NANO and Si5351 and a 0.96″ OLED. I was wondering if you could help me. I’m trying to find details of the 9XF24D ssb filter. Do you have a source for the part or the specifications so I can find something similar? I’m learning through constructing (no expert), and a home brew 40m ssb transceiver for SOTA would be a big bonus on longer walks. For the 9XF24D filter I only found the outline package which is the same like the 9MXF24D filter. But I am not sure if electrical data is equivalent. But both filters are 2.4kHz bandwidth filters thus I think they might be comparable. The Teledyne 172/12 relays seem to be the expensive part at the moment. I’ve not had your luck with €1 parts on eBay yet hihi. Excellent blog by the way, I’m enjoying reading through your projects. 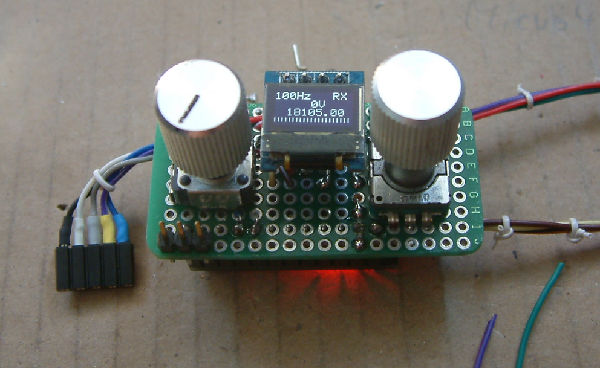 I’ve reproduced Peter’s Micro40 circuit in recent months, with very good results. Without wishing to devalue Peter’s warning about inferior relays in any way, I used these surface mount relays, commonly available, with excellent results. These ones are good quality, but similar ones are not hard to find. I will post on my build soon, just waiting to get the chance to take it to a SOTA summit for a ‘field test’! And thanks for the comment on the relays you have found. I think the crucial word is “Telecom Relay”. Great hint, I am on search for equivalents to the Teledyne ones because they are running out in my stock. Built too many transceivers the recent years. 😉 I have put the relays into socket strips but don’t want to open the “old” rigs to get the relay unplugged for a new project. Hi Peter, I must have bought and used 30 of these particular relays in the past few years, in receivers and transceiver projects. When you get onto a good thing, stick to it! Sorry, it’s Micro42 not 40, I knew that. More soon. de VK3HN. I have recently come across the Skyworks AS169-73 solid state SPDT switches and used them in a multi band BPF for HF. They work extremely well, especially at HF (see data sheets). They might be a candidate for switching the crystal filter in place of relays perhaps. You would need four of them of course to replicate the relays. They have two select pins which must be fed 180degrees out of phase but easy to do with a tinylogic inverter chip. Both the AS169 and inverter chip are tiny. Well suited to a tiny HF rig! I bought the AS169-73 from Farnell/Element14. Around one US$.